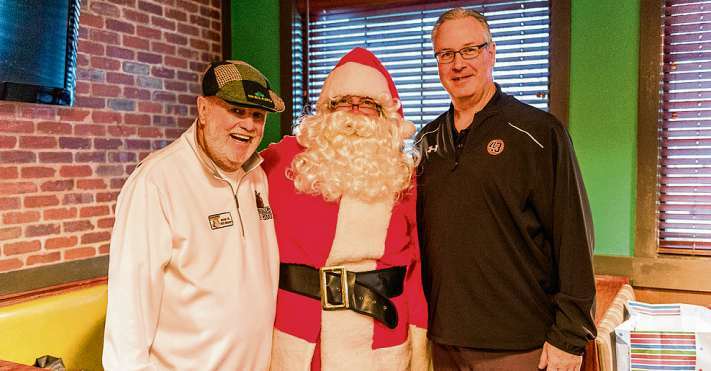 Helping One Guy founder and CEO Bob Kelly (left) poses with Mike Lutzenkirchen, executive director of the Lutzie43 Foundation, during a breakfast with Santa. ACWORTH Familiar faces and smiling patrons greet Bob Kelly as he makes his way through the lobby of the O’Charley’s restaurant on Highway 41 in Acworth. Kelly greets them back with a familiar, warm smile and by name - something only an individual connected to their community could do. These interactions are the crux of Kelly’s nonprofit Helping One Guy - a NorthStar Church ministry that serves to honor and support men and their families whose lives have encountered a life-changing crisis, ranging from cancer to the loss of a loved one. At each bi-monthly dinner - in this case, a breakfast with Santa - an individual enduring a crisis is recognized as the honoree. They receive donations pooled together by patrons and other donors along with the community Kelly sees as vital. At the recent breakfast, Acworth’s Horizon Field a baseball held for children with special needs - was the honoree. “It’s just been a great community effort and the community supports me,” Kelly said. HOG has been operating for seven years, and Kelly said he relies on restaurant sponsors like O’Charley’s and Carrabba’s to help supply food while staff from places like Johnny’s Pizza in Kennesaw help distribute food. Kelly said the idea to start HOG came after he heard a sermon that intertwined about David, Goliath and Bobby Cox - how no matter your size or who you are, you can make a difference. He then heard about a group called Helping One Woman, an organization that serves in a similar capacity, and thus, HOG was bom. “I think somewhere along the line, I got a message from the Lord,” Kelly said. Kelly said he hopes HOG continues to serve the community well and that it grows to continue enabling those involved to do a good job. To get involved with HOG, contact Bob Kelly at 770-6397694 or bob@helpingoneguy.org. Each Sunday, we write about a deserving individual, charity events such as fun runs, volunteer projects and other community gatherings that benefit a good cause. To suggest an event or person for us to cover, contact us at ajc. doinggood@gmail.com.